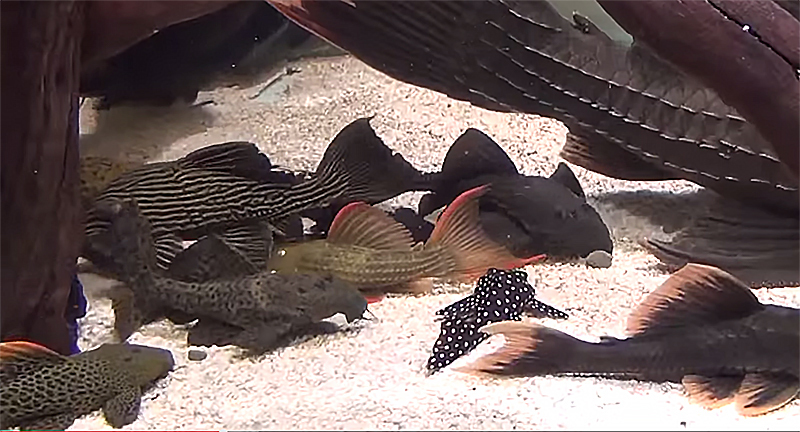 Today’s video selection features a large collection of Loricarid Catfishes kept by an aquarist in Hong Kong, CWL YAM. As one AMAZONAS contributor commented, “Amazingly healthy fish but beyond anything I would call crowding.” Another countered, “If the fish are exhibiting normal behavior, are healthy, and the aquarium’s husbandry is immaculate, are they really crowded?” The debate over stocking levels will rage on (what do you think? ), but we can all agree this is an impressive and diverse collection of plecostomus! Yes, it might be a bit crowded, but African cichlid keepers have been doing much worse for decades. You either give aggressive fish so much space that they have no conflicts, or you don’t allow them to set up any territories. They all look very healthy and they are obviously comfortable in the tank considering how quickly they all went for the food. Water quality is the key anyway as I used to raise angelfish and would raise 100 to 125 up to nickel size in 15 gallon tanks – one time I experimented with 175 – and every single time I had no burnt fins, not more than 5 deaths each year and they had all their fin extensions intact even at that rate of crowding. Only had one brought back to the shops by a customer after it died within a day. If African keepers can do it, then why not others? I don’t think it’s crowded at all. The tank is immaculate and the fish are stunning. I’m sure you do frequent water changes. I don't think it's crowded at all. The tank is immaculate and the fish are stunning. I'm sure you do frequent water changes. Yes, it might be a bit crowded, but African cichlid keepers have been doing much worse for decades. You either give aggressive fish so much space that they have no conflicts, or you don't allow them to set up any territories. They all look very healthy and they are obviously comfortable in the tank considering how quickly they all went for the food. Water quality is the key anyway as I used to raise angelfish and would raise 100 to 125 up to nickel size in 15 gallon tanks - one time I experimented with 175 - and every single time I had no burnt fins, not more than 5 deaths each year and they had all their fin extensions intact even at that rate of crowding. Only had one brought back to the shops by a customer after it died within a day. If African keepers can do it, then why not others?